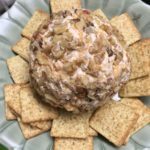 This diabetic friendly Holiday Cheese Ball is a great addition to you appetizer spread at a dinner party or holiday celebration! Allow the cream cheese to come to room temperature for at least 30 minutes. Once softened, combine the cream cheese, dressing, onion powder, and garlic powder in a large bowl. Cover and place into the fridge to chill for 30 minutes. Once chilled, form mixture into a ball and coat with the chopped walnuts until entirely covered. Wrap the entire ball in plastic wrap in place in the fridge until ready to serve.